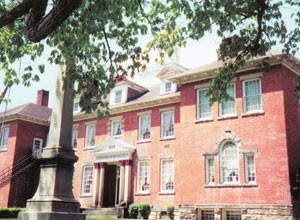 Franklin Musuem of New Athens, Ohio, is located in the building that housed Franklin College from 1900 until it closed in 1921. The college was chartered in 1825 as Alma College but its name was soon changed to Franklin College. The college was preceded by the Alma Academy, which had been started in 1818. Although a small institution, Franklin College boasted numerous influential graduates of national and international renown, including 8 U.S. Senators, 9 U.S. Representatives, 20 State Legislators, 47 physicians, over 113 educators and over 440 ministers. A few of the more notable graduates include: John Bingham, Congressman and author of the due process clause of the 14th Amendment to the Constitution and chief deputy prosecutor of President Lincoln�s assassins; Titus Basfield, an ex-slave who was one of the first Aftrican-American graduates from an Ohio College; William Lawrence, first Controller of the U.S. Treasury; John Kuhn, one of the founders of the Republican Party; and Joseph Ray, who authored "Ray�s Arithmetic" books. From its inception, Franklin College was a "hot bed" of abolitionist sentiment and its founder and alumni played a significant role in the anti-slavery movement. Reverend John Walker, preacher, physician, and strong abolitionist was the founder of Franklin College. He also was the co-founder of the village of New Athens. The name, New Athens, was selected because he wanted to establish a center of classical learning and felt that Athens, Greece was the epitome of classical learning, thus the name, new Athens. 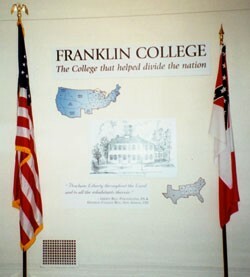 Franklin College closed in 1921, and its charter was later transferred to Muskingum College in New Concord, Ohio. The building was used as a school for grades 1-12 until 1971 and then as a grade school until 1987. In 1990, the building was designated as the Franklin Museum. It is listed in the National Registry of Historic Places. The Franklin Museum is located in New Athens, Ohio on Route 9 between St. Clairsville and Cadiz and is approximately 25 miles from Wheeling, West Virginia. It is approximately 9 miles from Interstate 70 and 3 miles from Flushing, Ohio. The Franklin Museum is open May through September on Tuesday, Wednesday and Thursday from 12 noon until 4:00 P.M. Arrangements may be made to have it open at any time by calling 740-968-1042 or 740-968-4066. Admission is $5.00 per person. Allow a mimimun of one hour for a tour of the museum. A small gift shop is located in the museum. Catered meals can be arranged for groups. The gymnasium can be rented for parties, receptions, trade shows, etc.